Well, an "obtainable" one so to speak. Just perfect IMO. I'd choose a mk1 CS over it any day of the week though. Mk1 is the original and CS is what the car is about. There isn't a bad GT3 to choose from though. They all have that Porsche Motorsport DNA. That car has been for sale for a few months now. Almost bought a cobalt c4s a few years back and kicking myself for not doing it. Ive seen two of these locally and its just one of those moment where I utter, " I MUST own one at some point". Sadly unless my number come up it aint going to happen. I need a reasonable amount of bodywork done on mine and Im seriously considering a full change to this colour. What about this one then.....lovely. I meant out of the Mk2 specific colours. You know I love Guards and Speed yellow on them. Wow Graeme you've just stumbled upon my dream GT3. I learned about that car years ago before I ever had my GT3. I haven't read the advert so it probably tells you in there but it's unique. Only one in that colour. I've always said if I came into a chunk of cash I'd try and find that exact car or the mint green Jasmine built 964RS rep. Either one of those in my garage and I'd never look at the classifieds again. Anyway I'm away to have a proper look at the advert, even though it's sold and I have no money. What a colour and yep I'd probably overlook the fact it's not a CS. Also - As Ned says, Graeme you've got to see yours would look ace like that. Get it done. I know it's boring and been done to death but the Mk1 Aerokit is bang on. 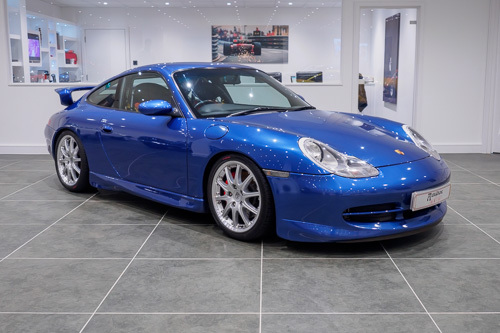 I think I might go for Viola Metallic on my respray, in my opinion one of the nicest colours on a 996 with aerokit. Not too shouty. Ive been watching a bumper and side skirt set on ebay for a month or so. Sadly side skirts are fiberglass it seems. Tempted to put in an offer and see what happens. That looks the dogs danglies. Have to say it suits the Mk2 well. I still prefer the MK1 GT3 though as said earlier in this thread. I'll have this one please. Zanzibar!